Maurijn van der Zee is a tenure-track assistant professor at Leiden University in the Netherlands. His primary interest is to understand the genetic and developmental mechanisms that underlie evolutionary change in animals, but recently he has been exploring a new field: innate immunity in insects. Six months ago he became a father for the first time ‘to a beautiful daughter’. His first PhD student also graduated very recently: he says that this also felt a bit like becoming a father. 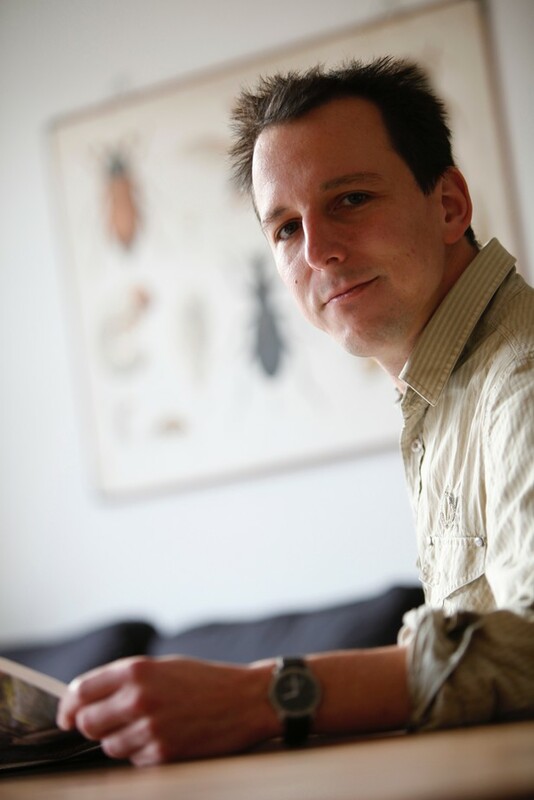 Maurijn also enjoys writing popular science articles for the Dutch press and giving public lectures. Maurijn van der Zee in his office. Image credit: Edwin Weers. What attracted you to studying innate immunity? Actually, my primary interest isn’t innate immunity but to find the genetic and developmental mechanisms that underlie evolutionary changes in animals. For example, in most insects, an intricately folded membrane develops over the egg and early embryo. However, this doesn’t happen in fruit flies, which are widely used in research. An obvious question about this difference is: what is that membrane for? It took us a while to find out. We discovered that the membrane covering insect eggs harbours their innate immunity – their first line of immune defence. This means that insect eggs can actively defend themselves against microbes through a potent immune response located in this membrane (Jacobs, Spaink and van der Zee, 2014). Because nobody was thinking along these lines. Much of what we know about insect innate immunity comes from studying fruit flies, but their eggs have a very poor immune response. So scientists were asking questions like: how do insect mothers protect their eggs against microbes? Our paper changes this question to: how do insect eggs defend themselves? This is very relevant in ecology: all those insect eggs in your back yard are actually not passive but are chemical factories attacking microbes. Usually I describe my research in quite a humorous way. How else can I explain that I work on a tiny beetle (called Tribolium castaneum) that is just 4mm long?! But it helps that in 2011 a Nobel Prize was awarded to Jules Hoffmann for his work on innate immunity in flies. His findings show people that fundamental research on insects is serious, useful and drives humankind forward. We continue with our research on the innate immune system in a wider context, comparing more invertebrate species to each other, and I continue to pursue my fundamental interest in understanding changes in evolution. During my PhD, when I finally understood why mutant larvae of the Tribolium beetle end up completely inside-out. A gene called Tc-zen2 is involved in the correct folding of the embryo at the end of embryonic development. When it malfunctions, embryos fold completely the wrong way around, ending up with their legs inside and their internal organs on the outside; very bizarre. During my first postdoc, when two other groups published the same results before us. I remember a colleague saying: “They did everything we did, everything we wanted to do, and a little bit more”. Many people at different stages have influenced my career but my PhD supervisor, Siegfried Roth, has had the biggest influence. He works on Tribolium, and it was during discussions with him that the very first idea leading to our eLife paper was born. You must have heard this answer before, but the assessment of scientists should be based on WHAT scientists publish, not on WHERE they publish. More permanent jobs should be created. I am 38 years old and for the first time in my life, I am on tenure track and finally have the prospect (only the prospect!) of a permanent job. This situation makes it impossible for a young scientist to plan a human life involving a family. My wife is a biologist too, and we met during a mouse embryology course while doing our PhDs in Cologne. She is currently a postdoc at Utrecht University and is an immunologist, so is obviously very happy with my recent interest in this field. We work on different areas of immunology but it is important that we understand each other’s lives. Until now, I would have answered “no” to this question. I have always ensured I have enough time for the people important to me. But since having a child, the answer is: yes. My wife takes primary care of our daughter, and I would love to help her more, but my job doesn’t allow for this at the moment. I would like to be in a country where there is still funding for fundamental research. This is the only type of research that really drives us forward. To people who know me this is not surprising, but I try to spend a lot of time transferring scientific knowledge to the general public. I have been giving lectures and writing popular scientific articles for several years, and am regularly asked to talk about science on Dutch radio.